Benjamin Cahan was the original developer and co-founder of Final Draft®, the worldwide leader in screenwriting software for motion picture and television industries. As the company's CEO from 1989 to 2001, he took Final Draft from a home-based software company to a valuable brand name respected and used by the majority of writers, producers and studios across the globe. 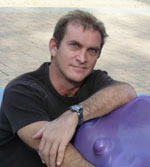 Prior to developing Final Draft, Mr. Cahan received a Bachelor of Science degree in Computer Science from the University of Maryland in 1984. He worked as a computer programmer for IBM during his college years and moved to Los Angeles after graduation to work for a defense contractor in Los Angeles. Eighteen months later, after taking a film production class at the University of Southern California, he left the defense industry and formed his own company developing film production software. The idea for Talentville was born in 2009 when Mr. Cahan was scouring the internet for a comprehensive site that filled the needs of both writers and the Hollywood professional community alike. Failing to find any site that in his opinion truly addressed all the needs of aspiring writers, from reviews and coverage to networking, industry participation to active project marketing, continuing education to collaboration, he set out to combine all these necessary elements in one place.